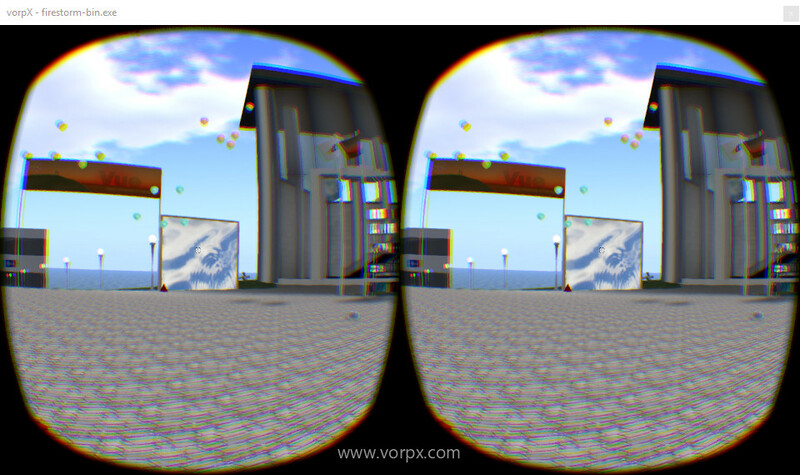 While CtrlAltStudio viewer 1.2.6.43412 has provided 3D/VR access for the Oculus Rift in Second Life and OpenSim, there is another way to explore virtual worlds in VR – through VorpX. 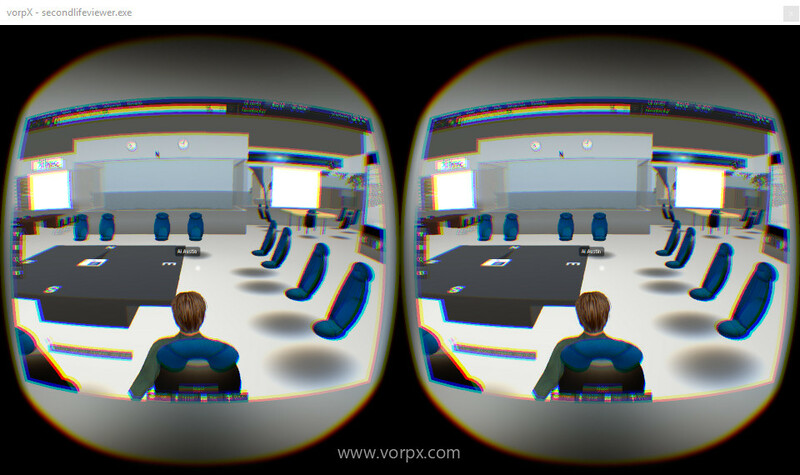 VorpX allows some applications and games not specifically designed for VR headsets to work in 3D/VR mode. 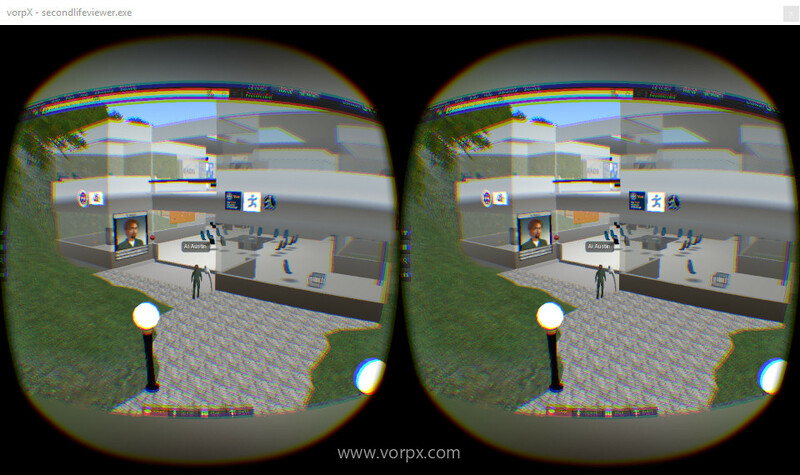 With virtual world viewers such as Firestorm (4.7.9 tested) and Linden Lab’s own viewer (4.0.6 tested) you can visit and view virtual world regions in an Oculus Rift (DK2 or CV1) or HTC Vive Headset. It should work with other viewers. 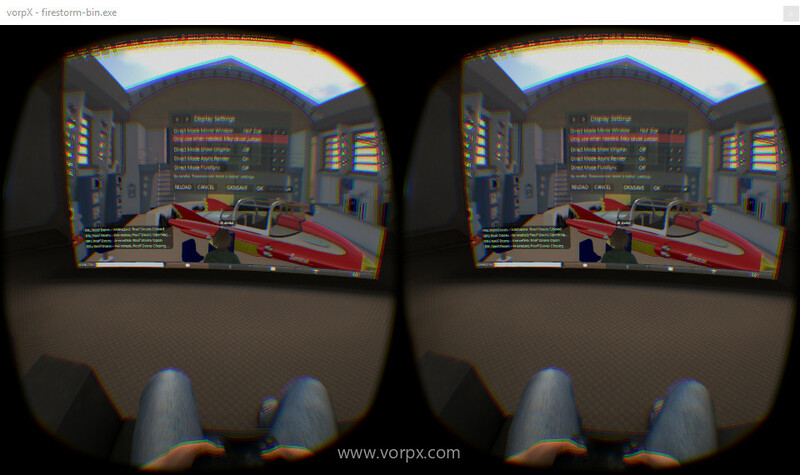 The details below are for tests with the Oculus Rift DK2 and CV1. VorpX costs £27.99 (UK) or the equivalent and does have a few issues (see later). Unless you want to use a specific virtual worlds viewer, you may wish to try CtrlAltStudio which is free and has better 3D geometry visuals (see “How Does This Work?” below). Ensure you have a working Oculus Home setup. Install VorpX and start it up. Launch the Firestorm viewer, which should then automatically launch Oculus Home if it is not already running. The Firestorm window may just show on the 2D monitor as a white blank window. The application should be running in your Oculus headset. Dismiss the Oculus health and safety warning if need be to see the login screen. Use Shift + Mouse Scroll Wheel to zoom the 2D Firestorm windows away from or towards you so the login details and buttons are visible. Push the Middle Mouse Scroll Wheel button down to activate VorpX’s “EdgePeek” feature, which will show the whole Firestorm screen. In this mode you can gaze at menus and buttons, and push the left or right mouse button to activate things while continuing to hold the Middle Scroll Wheel button. You will then see a 2D view of your scene in 3rd person mode projected as a large virtual cinema style screen in front of you. You can zoom this further away or more towards you to fill your field of view using Shift+Mouse Scroll Wheel or see it all using the Middle Scroll Wheel button to activate “EdgePeek” as described above. Enter 3D/VR view mode by moving into 1st Person/”Mouselook” mode. You can usually do that with the “m” key or using Alt + Mouse Scroll Wheel. You can change the Field of View (FOV) using Space + Mouse Scroll Wheel when in 3D/VR mode too if the image does not cover your whole field of view, as it should for a better immersive effect. VorpX recommends that the application (Firestorm) window be set to 1280×1024 for best results. You can set the window size in Firestorm via the Advanced menu (“Ctrl+Alt_D” to show it if its not present). Use the “Delete” key to enter the VorpX Settings. In the “Display Settings” you can turn on the “Direct View Mirror Window” to mirror on your normal monitor what is in the VR headset (e.g. to capture screen shots such as those shown in this blog post). The “two barrel” view or a “direct” single screen view can be selected. When you have finished using the viewer through VorpX you can terminate the VorpX application (which has an icon in the notifications area of the Windows Taskbar. This will prevent it interfering with other normal Windows applications you wish to use. The Linden Lab Second Life viewer and third-party viewers, such as Firestorm based on the Linden Lab LGPL licensed code, use OpenGL for their 3D graphics. What appears to be happening when you are in a viewer’s 1st person/”Mouselook” mode using VorpX is that the scene is rendered around you and changes as your head set tracks round. But if you try to shift left or right you cannot see “around” objects. It is probably using the “Z-Buffer Mode (aka 2D + Depth)” of VorpX in which the 3D/Parallax effect is limited when compared to the Geometry 3D mode. This “3D Reconstruction” mode is an option in VorpX Settings (accessible using the “Delete” key) but cannot be enabled when using Firestorm since this requires DirectX 3D graphics. See this blog post for more information. 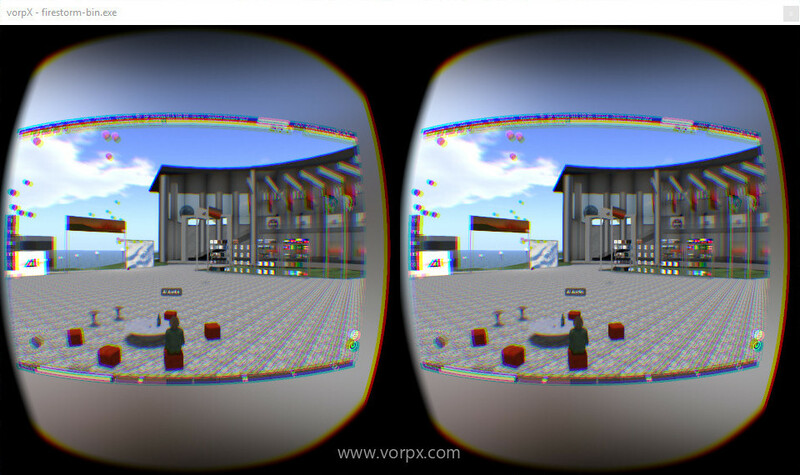 The CtrlAltStudio viewer 1.2.6.43412 provides full 3D geometry immersion in virtual worlds. The Firestorm viewer main menus did not seem to work in some modes when pressed with the left mouse button. Use the “EdgePeek” mode by pushing the Middle Mouse Scroll Wheel button if you get stuck. 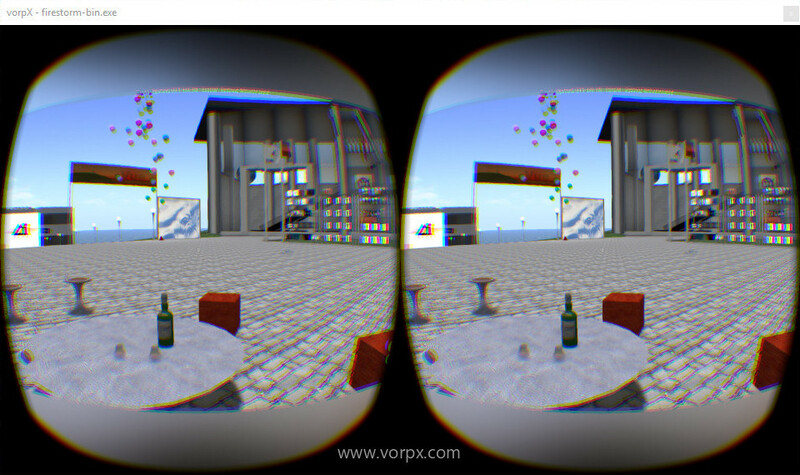 I found I had to change the Field of View or “Image Size” in VorpX when moving to and fro between the 2D mode (e.g. Image Size=0.40) and the 3D/VR mode (e.g. Image Size=0.60+) which can be done using Shift + Mouse Scroll Wheel rather than needing to go into VorpX Settings each time. When using the “Direct View Mirror Window” this can severely affect performance and the 3D/VR mode view will judder and not update smoothly as you move your head around. After VorpX has been used, even if you terminate the application afterwards, there can be Windows glitches afterwards such as the mouse cursor not properly being shown. Reboot to clear things up. While using the various Shift, Alt and Ctrl keys and the mouse scroll wheel, you might find you accidentally resize the desktop icons, which is done with Ctrl + mouse scroll wheel while the desktop has focus. If so, you can restore these with a right click on your desktop, and use View > select your preferred icon size (default Medium). I found I had to set a far away narrow FOV (or use “EdgePeek” when in the 2D mode to be able to see the menus for the login screen for example. But when in the 3D/VR mode and using such a narrow “far away” FOV a grey area will show within your view in the headset. This is shown in the left hand image below (with Image Size = 0.40). 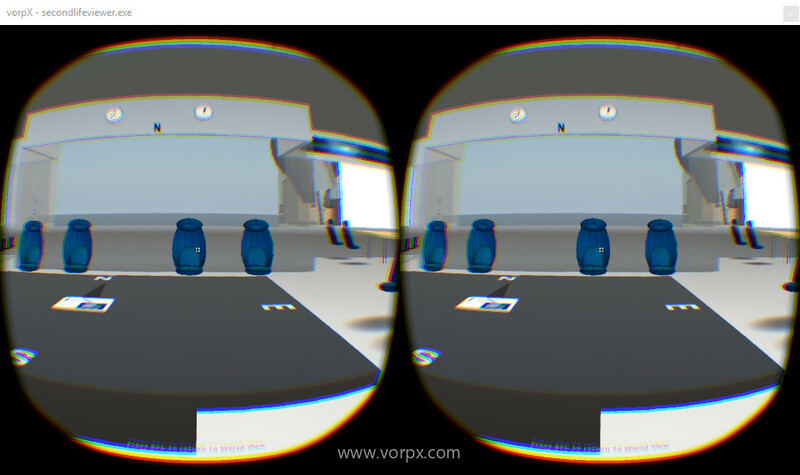 I needed to make the FOV be wider when in the 3D/VR view as seen I the right hand image below (with Image Size = 0.60+). 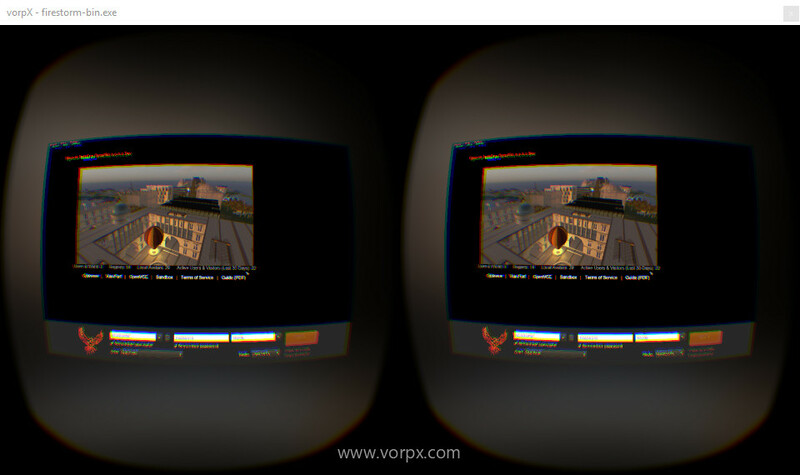 VorpX also provides a “Virtual Cinema Mode” via its settings. This simply shows the application on a large screen in front of you like the 2D view described above, but set in a lounge area with seats and a player figure. It is not usually what you would use for VR via a virtual world viewer. Remember that you have to be in 1st person/”Mouselook” mode to see the 3D effect, as shown in the right hand image below (click on the thumbnail for the larger screenshot). This entry was posted in Oculus, OpenSim, Second Life, Virtual World, VR and tagged Oculus, OpenSim, Rift, Second Life, vorpX, VR. Bookmark the permalink. This looks interesting. I wish it were available for OpenSuse Linux.